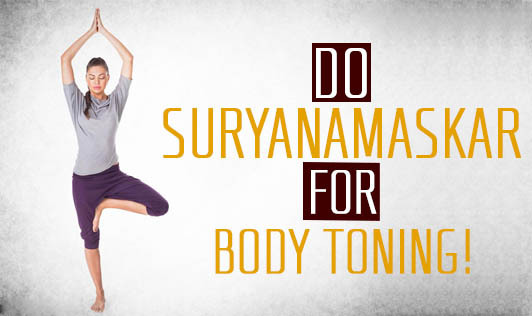 Do Suryanamaskar For Body Toning! Suryanamaskar benefits your body and mind like no other exercise. No wonder, the world is going bonkers over this ancient tradition of worshipping and saluting the Sun. Many celebrities endorse it over gym workouts and bizarre diets. Suryanamaskar, a set of 12 fixed cyclic postures when performed at an easy pace can bring a sense of well-being into oneself. It is a great exercise to improve posture, improve stamina and helps get rid of love handles. However, you need to take your doctor's consent before starting this routine if you are known to have any heart condition, slip disc or arthritis. With the surging popularity of suryanamaskar, jumpstarting to this exercise is not the best thing to do. If you are a beginner or if you haven't stretched your muscles for ages, then give your body some time to open up with some stretching and stamina building exercises before directly splurging on to this arduous exercise.